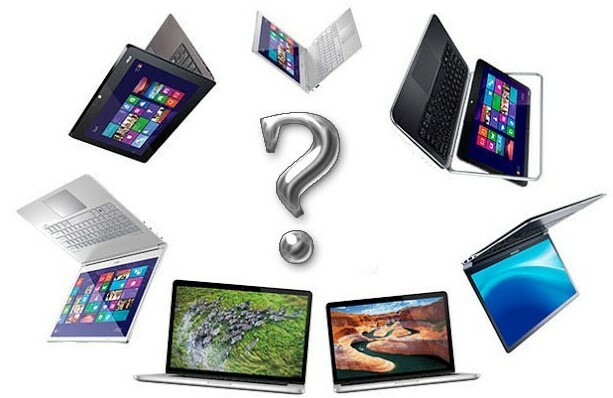 Tips Alert: Read This Article Before Buying New Laptop :- Useful Tips & Tricks. Read This Article Before Buying New Laptop :- Useful Tips & Tricks. Purchasing a home or business laptop can be a much more confusing and sometimes frightening experience. Below is a listing of help and tips when considering to purchase a laptop computer. When purchasing a computer, it is likely that you are going to have a general idea of what you may like in the computer or how you would like to configure the computer. Below is a listing of the various components likely to be found in a computer, and recommendations and tips when considering any of the below components. All portable computers come with a display. While it is almost always possible to hook up an external monitor when traveling with the laptop, the display is an important consideration. When looking at the display, ensure it is large enough for your needs. A very easy method of reducing the cost of the laptop is to reduce the size of the screen, unless price is an important consideration we highly suggest that you purchase a laptop with at least a 12" or larger LCD and recommend an LCD size of 14". Finally, some users may also want to consider different media solutions. For example, many laptops allow for a standard floppy drive or an LS120 drive. The LS120 drive can read floppy diskettes and at the same time be used as a backup storage device as it can store up to 120MB on a LS120 diskette. Additionally, consider the option of a DVD* or CD-RW drive as opposed to a CD-ROM drive. Hard drives have and always will be an important consideration to think about when purchasing a new portable computer. Like a standard computer, the hard drive will be the destination of all your files and information, and if that drive is to become full, that drive must be replaced or another external drive needs to be added to the computer. When looking at the space of the hard drive, always get the maximum size hard drive, considering you will eventually always run out of space. Does the portable computer include any locking system? If yes, what locking system is included? This can be important for users who are on the road. Memory is and has always been an important consideration when looking at purchasing a computer. Determine the amount of memory included in the computer as well as verify if that memory can be upgraded in the future. The more memory the computer has, the more efficient the computer is capable or running. If a modem is required, ensure that a modem is included with the portable computer. In addition, verify if the modem is an internal or PC-CARD (PCMCIA) modem as you may require all the available PC-CARD slots in the future. PC-CARD modems are type II. If a network connection is required, ensure that a network card is included with the portable computer. In addition, verify if the network card is an internal or PC-CARD (PCMCIA) network card as you may require all the available PC-CARD slots in the future. Network PC-CARDs are type II that for most computers allows for an additional type II to be connected. The computer processor is and will always be an important consideration when purchasing a computer. Today, with multiple CPU/Processor manufacturers, it may be more confusing as well as more cost efficient to look at the different processors available. Sound cards are important when looking at purchasing a computer; however, the majority of all computer users will find that most standard sound cards will suit their needs. However, some users may enjoy purchasing more advanced sounds cards that will increase the amount of speakers that can be used and in some games and programs and the sound quality and capabilities. Weight is another important consideration when considering a portable as the computer will be carried; the lighter the portable computer, the more easy it will be to carry. Video cards are becoming an extremely important factor when purchasing a computer. While this may surprise some, a video card can make or break a computer when it comes to playing games on the computer. Most games today require additional video memory as well as special video modes such as OpenGL. With a video card with little video memory or without these modes, the computer will be unable to play these games. In addition, the advances in video cards can dramatically increase the user enjoyment of the game being played. When looking at purchasing any brand of portable computer you will hear good and bad stories. Regardless if the story is good or bad, these stories are always based on the experience of that user. While it may be true that the user had a bad or terrible experience with that computer, all computer manufacturers have had users who have had a bad experience and there is no such thing as a bad or perfect computer manufacturer. Below is a listing of various things to consider when purchasing a computer, and in some cases, how to tell the good from the bad and help allow you to purchase the portable computer that will suit your needs. Some computer manufacturers may try to sell additional add-ons when purchasing a portable computer. Unless you have done your research on the additional add-on, do not consider the add-on. While in some cases it may be beneficial to get a printer, scanner, camera or PC Cards with a computer, you may be paying premium for the additional add-on, or in the case of the printer, you may have to pay premium on the ink in the future. Do you research, ensure that if you get an additional hardware or add-ons that the hardware will suit your needs and that it does not end up being something that is not going to be used. We use location to describe different topics. First, what is the location of where the computer is purchased: If the computer is purchased at a local retail store, can the computer be returned to that store if unsatisfactory? If the computer is purchased through mail order or directly through the computer manufacturer or reseller, where can the computer be returned if unsatisfactory? Refurbished computers have a lower price and are a good deal for users looking for a better deal. However, compare the price of the refurbished computer to a new computer as well as to review all of the tips on this page as all the same rules, tricks, and tips still apply. Service is an important consideration to look at when looking to purchase a computer, new or used. The service is how many companies describe the repair of a computer if it or a component within it is to become broken. Below is a listing of recommended services. Software, for many computer users especially new users, is thought to be an important consideration when purchasing a new computer. Granted there is software that we highly recommend looking for when purchasing a computer, such as word processor or spread sheet program, some computer companies may over hype the software package. Below is a listing of what to look for when looking at the software included with a computer. While you can always contact Computer for support, manufacturer support for most users is another important consideration, as if an issue arises with the computer, you must be able to be able to contact a support representative. Things to consider when looking at the support options of a computer are shown below. While this option may not be considered at first when purchasing a computer, it is an important consideration. Below is a listing of different options to look for when looking to upgrade a portable computer. Warranty can cause frustrations for most users. We highly recommend that a computer only be considered if it has at least a one-year warranty. Many cheap computers only come with a 90 day warranty; meaning if a part goes bad, you pay for the part as well as the service. This may not be an issue for users who just need a cheap computer and are willing to replace parts and service the computer. Make sure you are paying for what you get. It has been known that computer companies may list a processor being a specific speed but may actually have a different speed into the computer. This, unfortunately, can be very easy as any user can 'over clock' a processor, making it appear as one speed but in reality being a completely different speed. For example, you may buy a 733MHz processor but instead get a 500MHz. When purchasing a computer, ensure it comes with legal software. Many end-users or small computer companies who build or sell computers may not provide you with legal copies of the software, which is illegal. Verify that the software that came with your computer is on a standard CD and not a burnt CD. A burnt or home-made CD will be a different looking CD and have a gold or green bottom. Ensure that if the software requires a license or registration number that it was included with the computer. An example of software that includes these certificates is Microsoft Office and Windows.